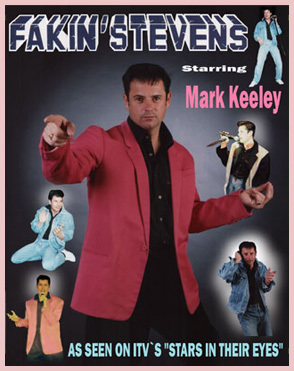 Shakin` Stevens, the most successful singer of the 80`s is captured perfectly by the talented Mark Keeley. The show is very visual and has all the energy that took Shakin` Stevens to stardom. Backed by "Good Rockin` Tonight", the UK`s No.1 Rock`n`Roll band, the songs are masterfully played just like the originals. The famous denims and pink jacket that Shakey wore, are all part of the show in which you will hear all the hits including "This Ole House", "Marie Marie", "You Drive Me Crazy", "Hot Dog", "Oh Julie", "It`s Late", "Green Door" and many more. Mark and his band are fully professional and have performed all over the country with this show. They have recently finished a national tour for Brannigans UK.